Snake Handling: How snakes are handled will depend upon the type of snake and its unique character. Some snakes may be lifted manually from the outset with no display of temper at all. Some might be irascible when initial encountered but will quiet as they become used to routines. Others might bite constantly and be so unpleasant that they should be moved with a snakehook or perhaps a clampstick. Snake Handling 101: Typically snakes happen to be placed in 3 groups: harmless (non-venomous), rear-fanged (mildly-venomous) and front-fanged (venomous). 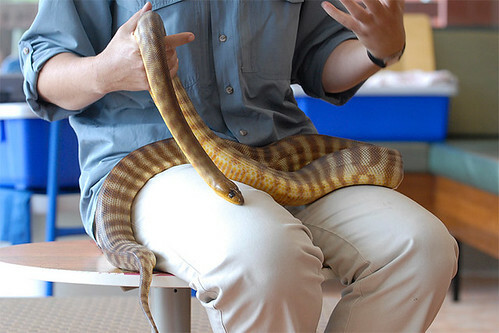 Unlike several other reptiles and amphibians that resist owner familiarity, other snakes could be safely and frequently handled if this is carried out gently. If you're new to the snake-keeping hobby, discuss the habits with the species you might be maintaining with other hobbyists and with employees within the dealerships that provide them. Read as significantly as it is possible to about the species that most interest you. Be certain the snake is aware of your presence. Don't surprise it or it may possibly attack. Next, deal with the snake when it's awake, but during the time of day that it can be most lethargic. It's essential to move slowly, and, if possible, approach from the side rather than from above. If the snake recoils into a striking "S," stop temporarily or use a hook or clamp stick. Use gloves when handling non-venomous snakes which are persistently snappy. If it's needed to a snake that has eaten recently or is preparing to shed its skin, do so extremely gently, supporting the snake as fully as possible. Never pin a snake or lift it by its neck, for the cervical vertebrae are delicate and, if damaged, the snake is apt to be permanently disabled. And last, when lifting a big or heavy bodied snake, slide your hand or perhaps a hook under its entire body about a third from the way back, begin lifting it, then help it appropriately just posterior to mid-body. A lot of bites happen because of complacency. The average venomous snake can be timid so much of the time that a handler can get overconfident, and when that snake finally does get motivated to seriously act out, they aren't prepared for the face-off. Training a new keeper on a snake that will always physically challenge them is better than letting them be surprised when a hot snake suddenly does its thing. People who train snake handling on long term captive snakes may not be prepared for a "snake emergency" when an animal starts 'biting back.' There are some species that retain quite a temper even as long term captives, and they are much more acceptable training animals. Although some species habituate and calm down fairly fast, or they rarely act out even when they are freshly wild caught. So an act-alike that will more reliably put up a fight is the better snake handler.